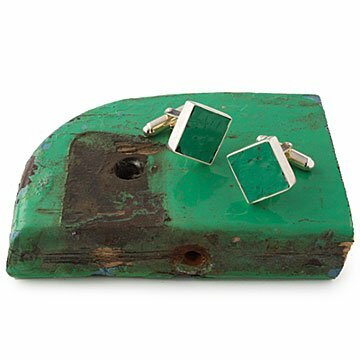 Hit a homerun in the office with these cufflinks made from salvaged seats of famous baseball stadiums. Take your favorite stadium out on the town while wearing these one-of-a-kind ballpark cufflinks. Made of material salvaged from the seats from famous ballparks, the sterling silver cufflinks give your baseball fan a handsome alternative to wearing his team's jersey for your Date Night. The colors will vary, but all are sure to look better with a suit than the "rally" cap. Each item comes with a certificate of authenticity. Created by designer Ward Wallau and Bill Hartel of St. Louis; Handmade in USA and Mexico. Color and condition of wood will vary slightly. A truly unique gift that has meaning for a Mets fan. Husband loves the cuff links! Definitely on the pricey side, but I know my fiance will love these. He's a big baseball fan and asked for tickets to a game last year as his birthday present. This year we'll be at the beach, so I'm bringing the stadium to him! One comment is there are definitely imperfections in the upcycled material, so be prepared for that. It doesn't bother me, as I think it adds to the charm, but something to be aware of! I got these cufflinks for my nephew who is a huge Red Sox fan and happens to love cufflinks...Just when you don't know what to buy - this pops up! This was the best gift I gave all year. My dad loved them. Now for my birthday I will get me a pair. Definitely recommend to others to buy. Such a great gift! The recipient is a huge baseball fan so this was a perfect gift for him. I bought these for my father, a lifelong Red Sox fan and he loved them. Not only are they neat for a sports fan, but they are also beautiful. Well done. The cufflinks were special because the recipient was from Baltimore. A unique piece of history. Great unique gift for the man that has everything! These cuff links are really unique and the perfect gift for a very difficult to shop for husband who also happens to be a diehard sports fan. Go Red Sox!